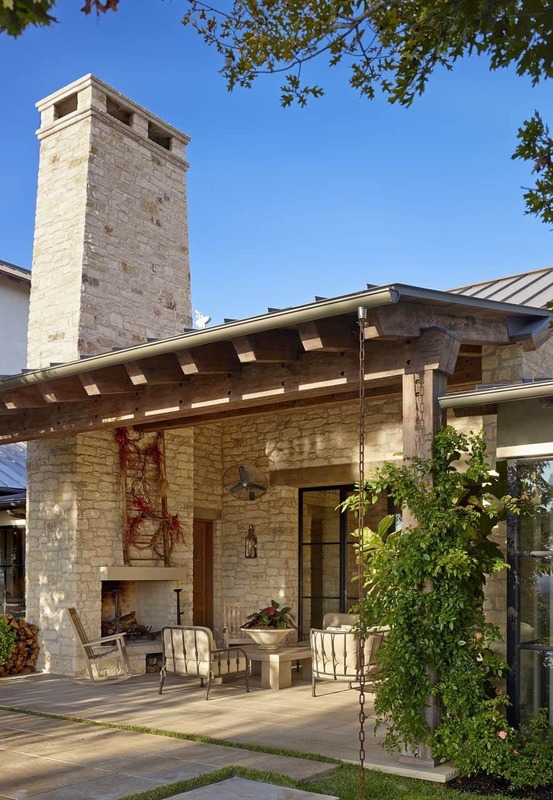 This gorgeous Mediterranean style house was designed by Ryan Street & Associates, located in the Estates on Stratford Mountain, just west of downtown Austin, Texas. 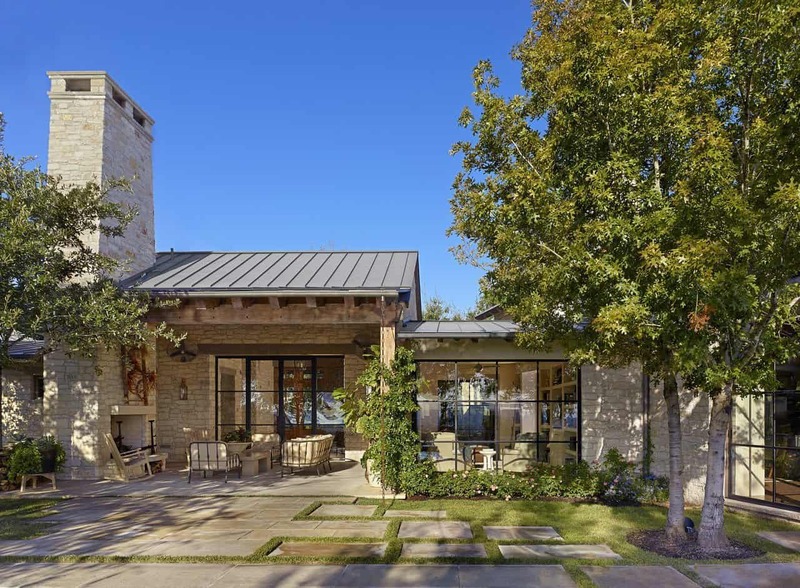 This 7,300 square foot, four bedroom, six bathroom house is nestled in a luxury gated community, one of just four homesites that overlooks Lady Bird Lake. 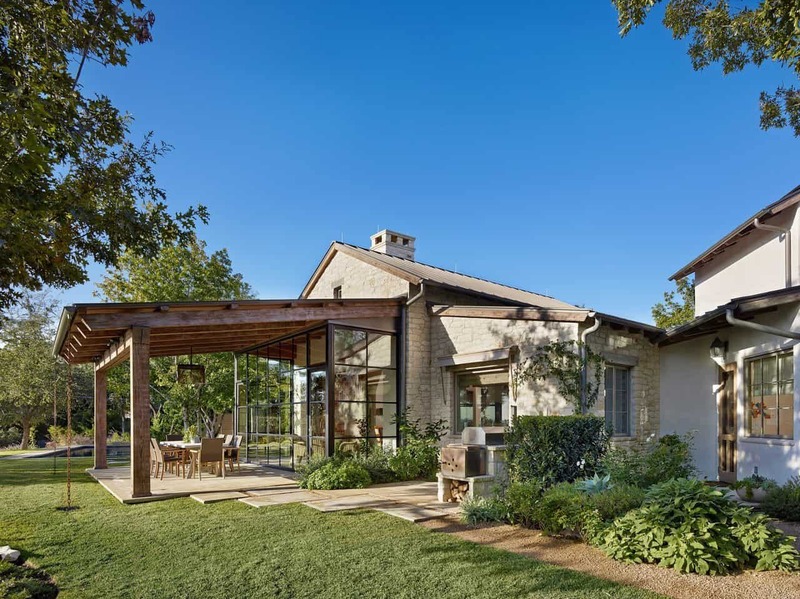 The property features rolling hills and mature trees, enjoying some of the most scenic landscapes that central Austin has to offer. 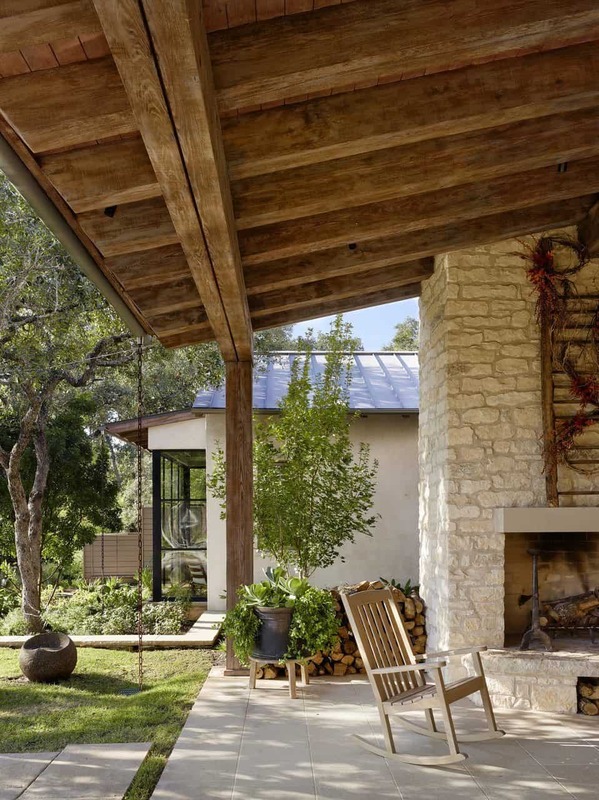 Although the home is not far from the downtown area, it enjoys a countryside seclusion that is very rare. 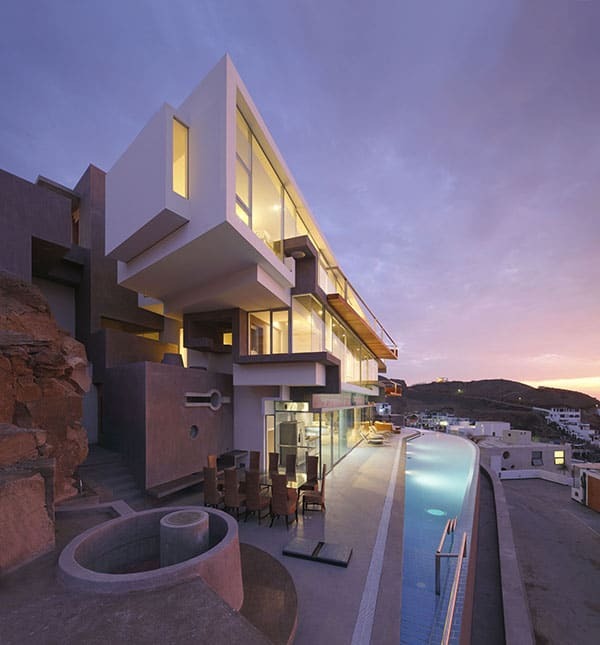 The home itself is quite simply stunning, both inside and out. 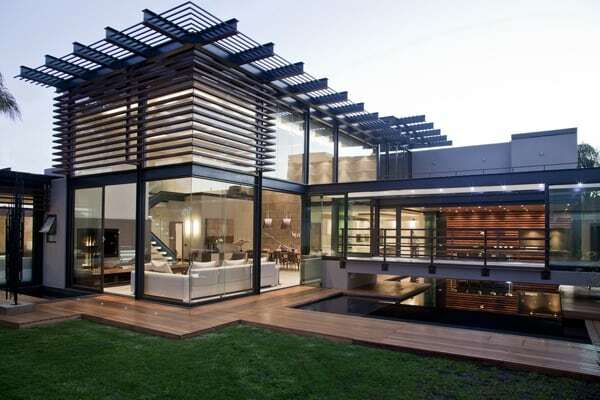 The experience begins from the moment of entry, crossing through a lovely handcrafted wooden door with glass panels. Stone walls surround you, with soaring ceilings and a gorgeous chandelier suspended from the ceiling. The interiors are warm and welcoming, drawing you in to enjoy all that this delectable home has to offer. 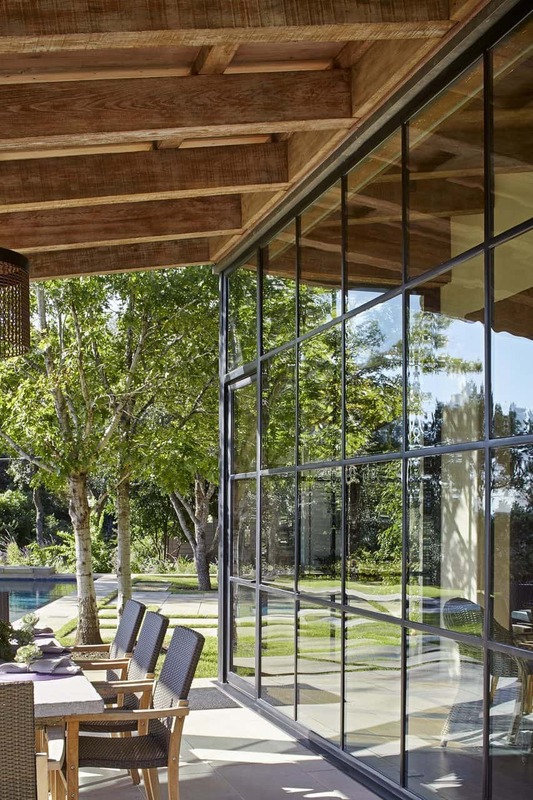 Through floor-to-ceiling, punched out steel framed windows, this cozy sunroom offers breathtaking views of rolling hills. 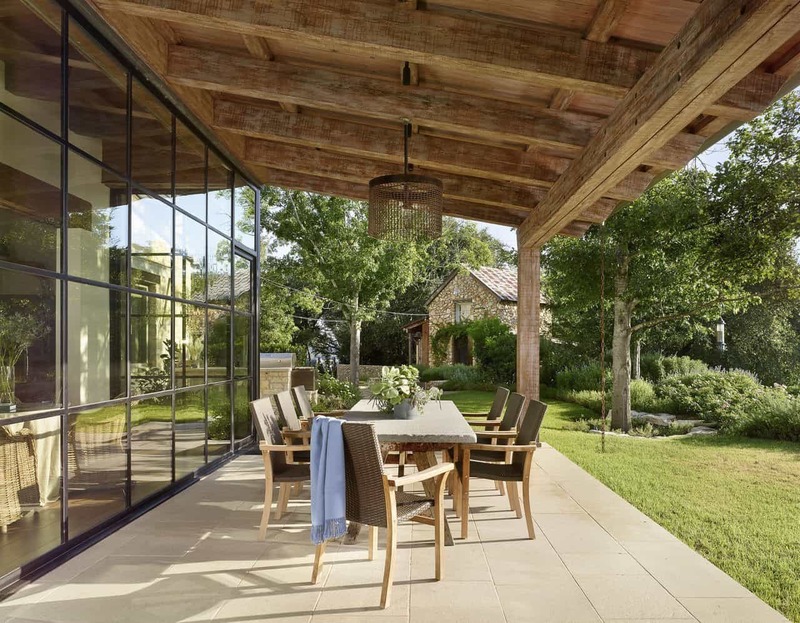 Houston-based interior designer Ginger Barber was responsible for the interiors of this beautiful home. 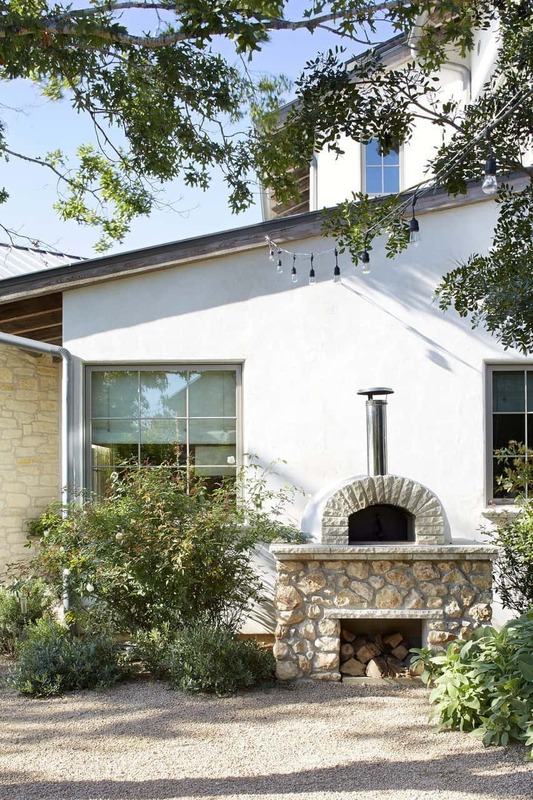 A covered patio shields outdoor diners from the harsh Texas sun during the warm summer months. 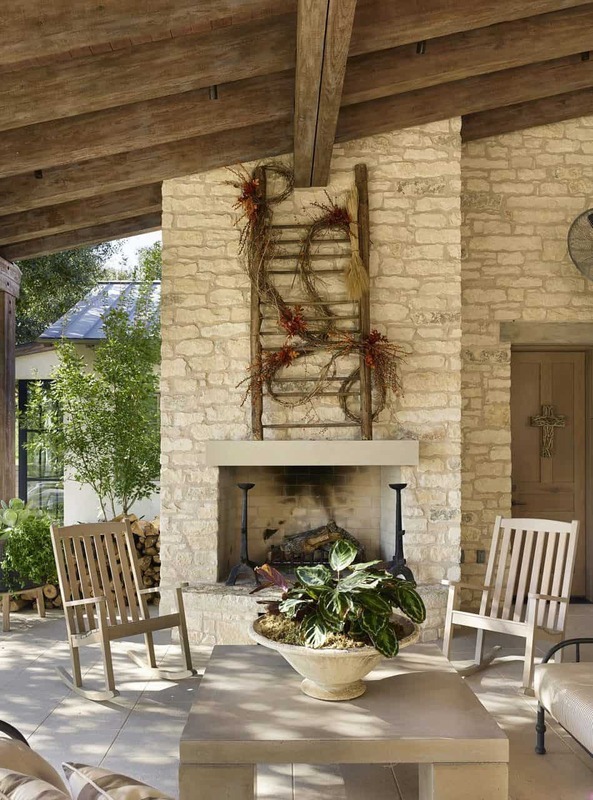 A farmhouse style living room offers cozy seating arranged around a centrally located fireplace with a reclaimed wood mantel. 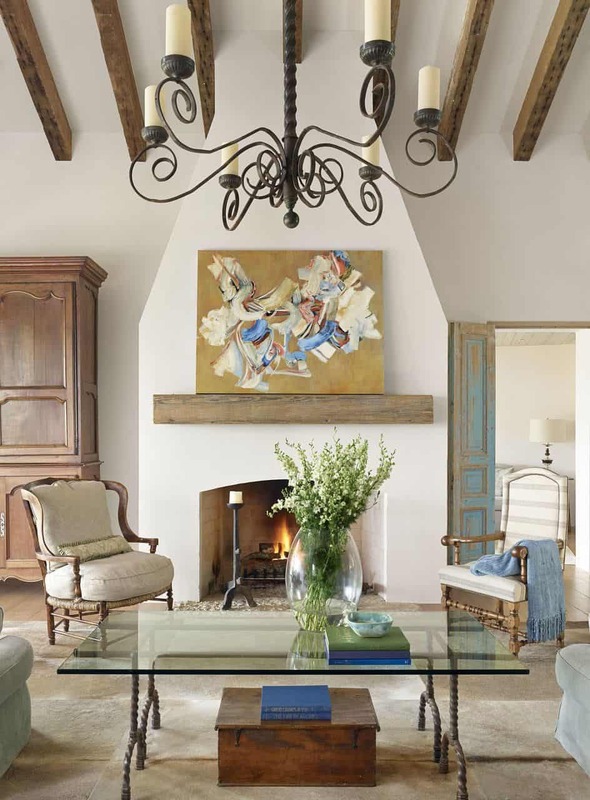 The contemporary artwork resting against the mantel has a variety of colors that have been pulled into the color scheme through accents (such as the throw) on an otherwise neutral palette. 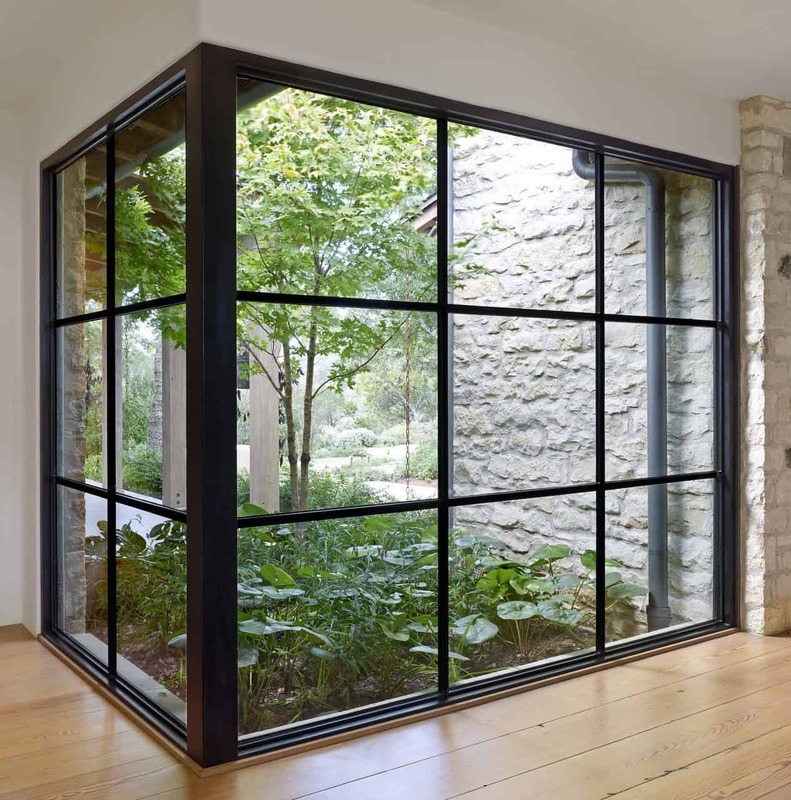 What We Love: Beautiful metal framed windows that captures the surrounding nature of the property on all sides, while at the same time penetrating the spaces with light. Warm wood flooring throughout with wood ceilings and structural beams adds a rustic aesthetic to this estate home that is breathtaking. 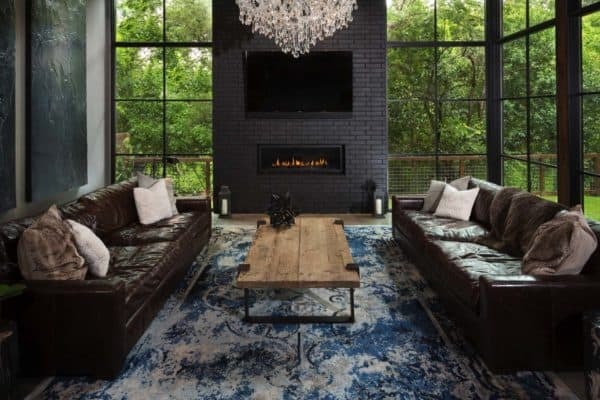 The soft fabrics and textures on the furnishings and area rugs adds to the overall aesthetic… home. 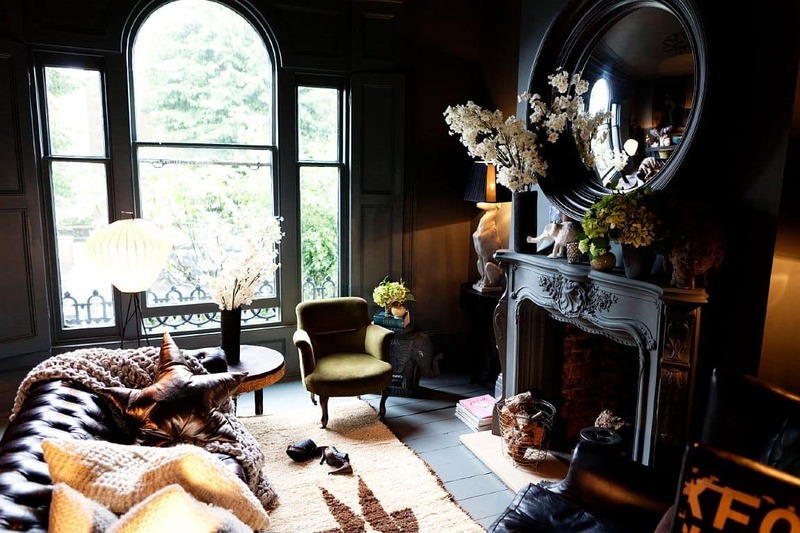 Tell us, do you find the interiors warm and inviting? 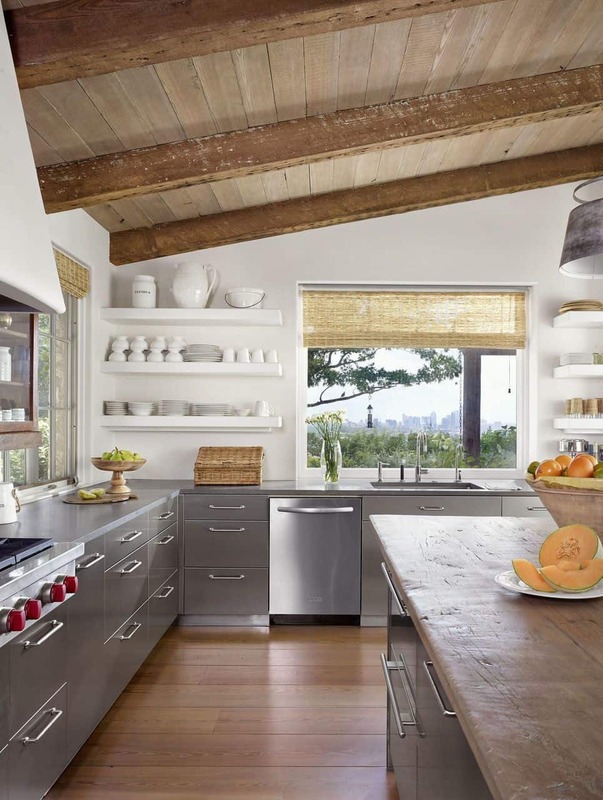 A farmhouse style kitchen offers white floating shelving to store extra dishes, custom-designed slab panel gray cabinets, high-end appliances such as Wolf and an engineered stone countertop for the perimeter counters and reclaimed wood on the island. 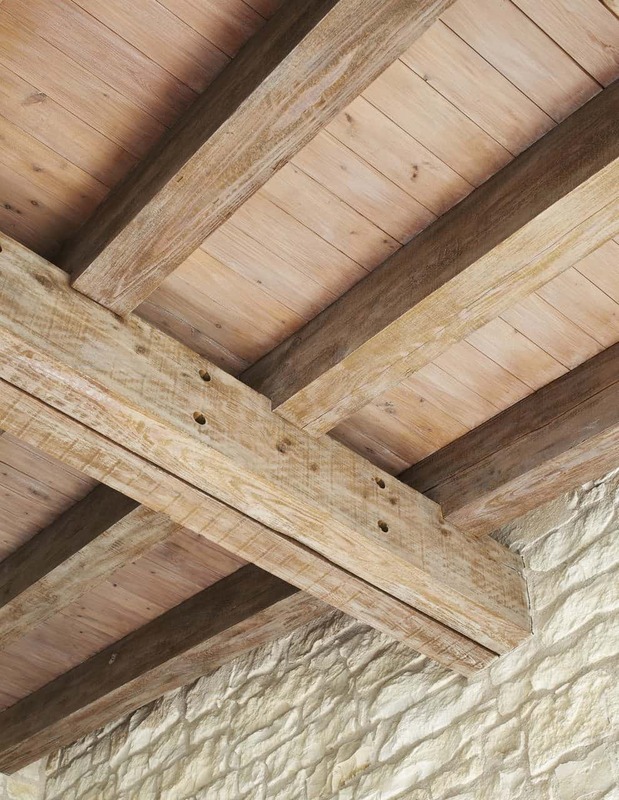 Wood plank flooring gives a rustic aesthetic to the space, mixed with wood clad ceilings and exposed, rough-hewn wood structural beams. Above: The exquisite heart pine flooring was salvaged from an old warehouse. 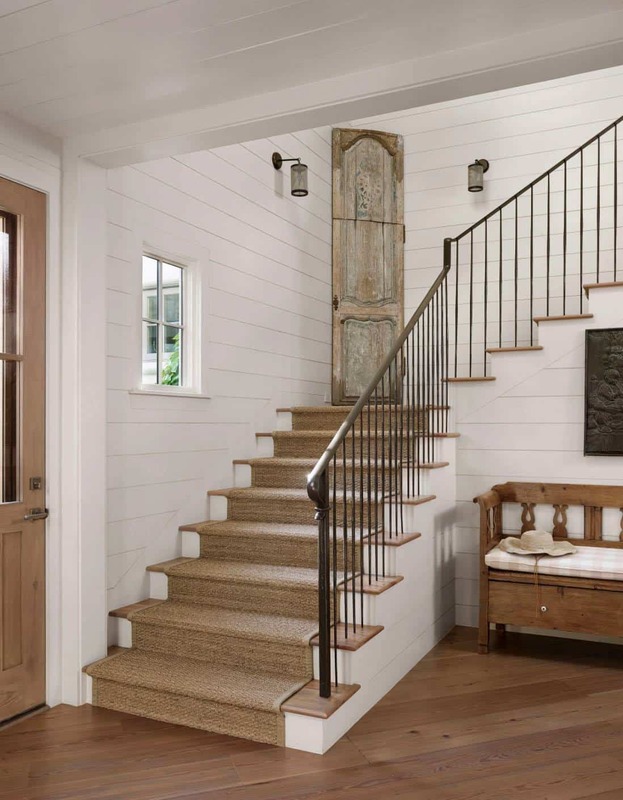 This intriguing staircase features wood stair treads covered with a sisal rug, a black iron railing, white clapboard siding, and as you make your way onto the first landing, a reclaimed antique door creates a unique focal point to the space. 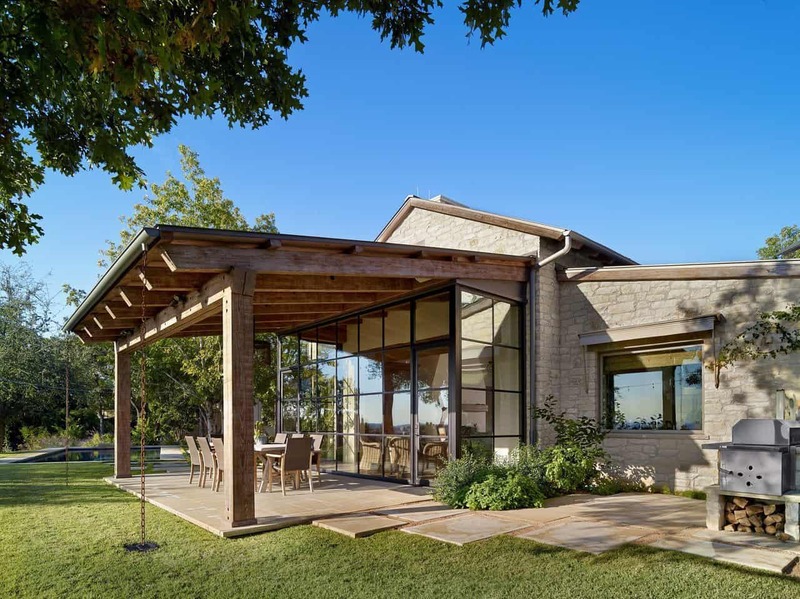 Have a look at another incredible property from Ryan Street & Associates that we featured awhile back, A rustic-modern home in Texas: Scenic Drive Project. 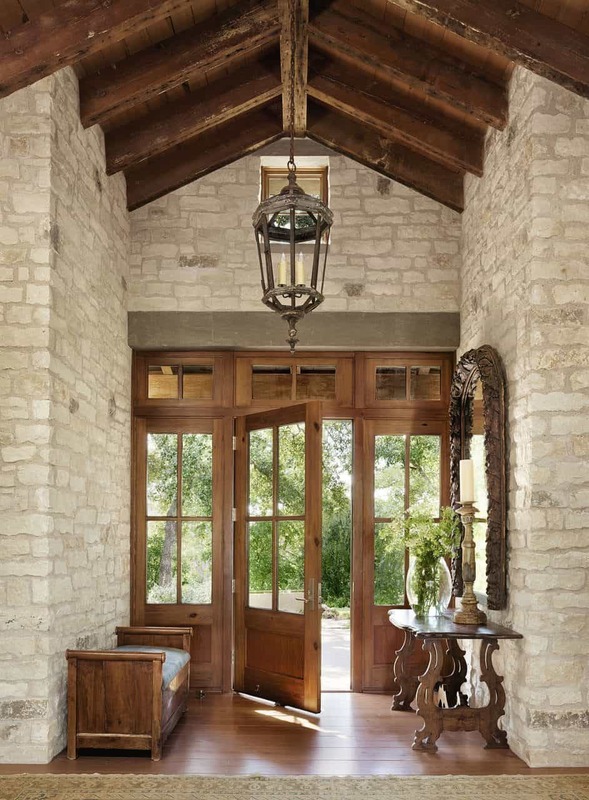 Can you tell me what stone is used in the foyer of this home? Hi Kellie, it is limestone! Can you tell me the color on the white walls? Hi, Can you tell why you even have comments and don’t answer them? Thanks.